It’s official: Prince William and Kate Middleton just introduced their new baby boy to the world. The royal couple debuted their newest addition and greeted the crowds outside the Lindo Wing at St. Mary’s Hospital just hours after Kate gave birth to an 8-pound, 7-ounce baby boy. The proud parents stood on the steps of the Lindo Wing with the newborn, similar to when they posed for pictures after the births of Prince George in 2013 and Princess Charlotte in 2015. 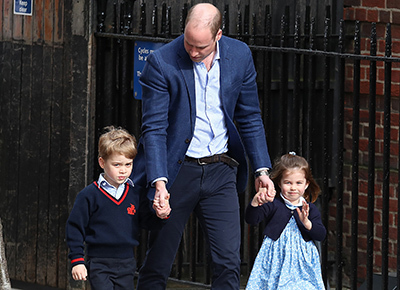 Prince William looked dapper in his go-to blue shirt and suit combo, while Kate opted for a chic red dress that could easily pass as a non-maternity outfit.